Don't believe there's nothing to do in North Bali. Well, just back from 10 days in North Bali and I read there is an exhibition “featuring the stunning pearls of Bali-based Atlas Pearls. The show focuses on the exquisite pearls farmed in North Bali.” And the exhibition is in……South Bali, at a famous hotel on Tanjung Benoa. After associating with the lovely people of North Bali for 10 days, I am quite taken aback. Should these products of North Bali not be displayed in North Bali and potential buyers taken up there to see them? The Autore Group in Lombok have a magnificent display in their shop situated on a pier jutting out into the sea, and right on the tourist route up the north-west coast. I suppose the fact that there are only a few 5 Star hotels up in the North puts some people off. Most are locally owned by very hospitable people, and quite unpretentious. There are few night clubs thumping out “music” until the wee hours but not once did we see any tourists in anything more formal than shorts or local garb. North Bali is pretty laid-back, and as a notice we spotted says, It’s “lekker” meaning it’s enjoyable, in the nicest possible ways. That’s the essence of North Bali or Buleleng, enjoyable. Only “city” is Singaraja (pop.150,000) former capital of Bali, in fact of all Nusa Tengarra, the islands between Bali and Timor. It is now just the capital of the Regency of Buleleng. It is much cooler in temperature than South Bali (av. 82ºF or 27.8ºC) and is a city of wide tree-lined streets and lots of friendly folk. 2 Universities are situated here. The main shopping is done on Jalan Diponegoro and Jalan A. Yani. There’s even a Carrefour and a Hardy’s. If you want local fruit, go to the Singaraja Market, but get there early. Only a few small hotels, which is why most tourists head west to Lovina. Near the old harbour you will see signs of Dutch heritage and there are remnants of other cultures which influenced Singaraja. The descendants of the Chinese, Arab and Bugis settlers still live in the harbour district, in areas nicknamed Kampong Arab and Kampong Bugis. On Puputan Square lies the Museum Bali, erected in 1932 by the Dutch in an attempt to preserve a historical account of Balinese culture. The museum buildings illustrate two types of construction in Bali: temples and palaces. The split gate, outer and inner courtyards, and kul kul drum typify the temple. The thatched roofs, ornate windows and verandahs characterise the palace. The main building, located at the back of the entrance courtyard, houses traditional artifacts from Bali’s prehistory, including a massive stone sarcophagus. The museum is open from 7.30 am to about noon daily except Monday. 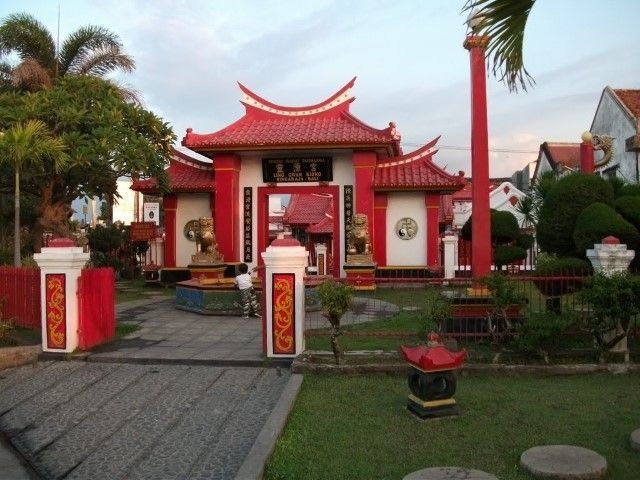 One of the few Chinese temples on Bali, a klenteng named Ling Gwan Kion can be seen just off the Jalan Erlangga, in the harbour district. 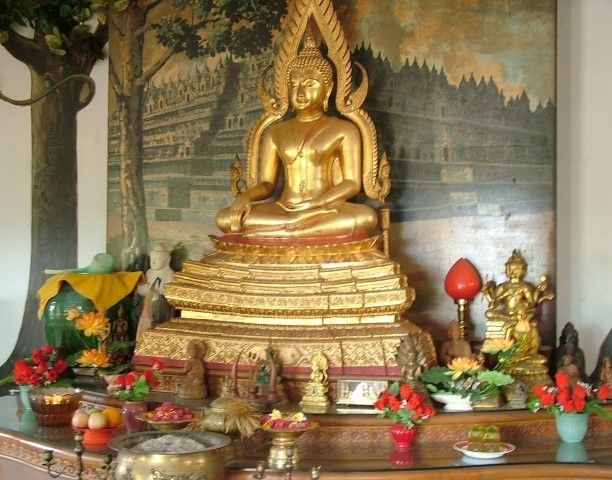 Built in 1873, it is approached via a bridge over a lotus pond, and houses magnificent golden Buddha statues. Visit the unique Lontar Museum library, the "Gedong Kirtya", at Jalan Veteran. The Gedong Kirtya preserves thousands of "lontar" (manuscripts made of palm leaf), "prasati" (transcriptions on metal plates) and books that deal with various aspects of life, such as religion, architecture, philosophy, genealogy, homeopathy, "usada" (medical manuscripts) and magic. Books are in Balinese and Kawi (old Javanese), as well as Dutch, English and German. "Puri Agung Buleleng", the Royal Palace of Singaraja, is close to the Lontar Library, on Jl. Mayor Metra. Here you can see a number of photos of Rajas of Buleleng, in the house where the Royal Family used to live. Whilst up north, we were told the story of Anak Agung Pandji Tisna (1908-1978), the only Regent in the 8 kingdoms of Bali to become a Christian, and the only Regent to not be cremated. In fact, a kind lady called Cherrah from Bali Taman Resort took us to his cemetery on a hill above Lovina, where many of his family are buried around a chapel which he had constructed. One of his family buried there was a Lutheran pastor. About 10 km east of Singaraja on the coast road is Pura Meduwe Karang, a large Hindu temple with many stone carvings, some quite scary. Daily offerings are made to ensure that crops are successful. There is a stone wall relief displaying the figure of the Dutch artist Nieuwenkamp, who cycled around Bali in the early 20th century. The bicycle wheels have lotus-flower spokes, Nieuwenkamp wears a floral sarong. The outer court is approached by steps which are adorned with a series of thirty-four statues, representing the various characters from the Ramayana epic. About 7 km further east along the coast road are the cold springs at Air Sanih, Kubutambahan with a natural swimming pool. A visit here combines well with Pura Medewe Karang. The bathhouse is located right by the beach, only a few meters from the sea. A noticeable feature is that the water is not salty, because it flows from Lake Batur to Yeh Sanih, about 40 kilometers. About 500 meters on, there is a place for diving or snorkeling, to see beautiful underwater coral reefs. Now head back through Singa Raja or “Lion King City”, noting the local love for statues, mostly outlandishly large. Keep going west along the newly surfaced (Sept.2015) road to Lovina Beach, which is actually a collection of the villages of Pemaron, Tukadmungga, Anturan, Kalibukbuk, Kaliasem, Kayu Putih, Temukus and Tigawasa. “Lovina” got its title after the last king of Buleleng, Pandji Tisna (1908-1978), named his holiday home ‘Lovina’ back in 1958. Some say the name means ‘the love in the heart of people’, others say it comes from ‘LOVe INdonesiA’. Pandji Tisna is reputed to have instigated tourism to North Bali. After passing Bali Taman Resort and a Pertimina gas station, on Jl. Singaraja-Seririt, look for the Banyuatis Kopi Factory on the left at Pemaron, worth a half-hour visit to see the preparation of coffee from beans farmed up at Banyuatis on the back Munduk road. There is a small shop selling their products – nice gifts packed to take home. Along the way you will pass a series of hotels, resorts and rental villas. Most have a concierge type who organizes tours and dolphin sighting boat trips, fishing trips and diving courses. Aditya Resort even boasts lodgings for tour drivers, as many of their tour groups overnight at the Resort. Bali is incomplete without Krisna Oleh Oleh Khas Bali. Now there is Krisna 5, located in the Village Temukus, close to Lovina Beach, the largest and most complete on the island. Get quality souvenirs at low prices in comfortable shopping atmosphere. Large parking area. This shop is not as crowded as the one on Jalan Sunset down in Kuta. Cocoa Grounds was created to educate tourists and local Balinese about the story of cocoa. A new experience - a chocolate cafe, cocoa museum and tour of a cocoa warehouse; visitors can enjoy all there is to know and taste about chocolate. Cocoa Grounds celebrates all things cocoa. A place for you to relish your curiosity of everything cocoa; with fun facts, games as well as chocolaty treats to cure your sweet tooth. Guests are invited you to enjoy your choice of chocolate drinks and food. The menu includes unique chocolate treats to cure your sweet tooth cravings. Jl. Raya Temukus No.7, Lovina-Singaraja - Bali, east of Gran Surya Hotel and Water Park. Horse Riding at Pegasus Farm. Spend a perfect day with your friends or family in a natural location riding horses, stroking the animals or simply soaking up the peaceful surroundings. Just a ten minute drive into the hills from Lovina. Horses and treks suitable for everyone – from exciting 2 hour jungle treks for adventurous riders to pony rides for children. Jl. Dewi Sri, Kayuputih, Lovina. Aditya Resort also boasts 2 horses for hire. Only 2 people can thus ride at a time and there is, thankfully, a weight restriction. The horses are smallish. No matter where you stay in Lovina, don’t miss the trip up the hill to Banjar and these 2 places. Brahmavihara Arama Budha - Buddhist Monastery was built in 1970. It is the biggest Buddhist temple in Bali. The complex enjoys a wonderful hillside setting with brilliant tiled roof over an entrance gate guarded by two fine naga, with bell tower in the corner of the middle courtyard. Many steps lead up the temple buildings to see expensive-looking Buddhas and the stupa. Estimated to be hundreds of years old, repaired by the Japanese. These hot springs “Air Panas Banjar” are only a short distance west and uphill of the monastery. Eight carved sandstone Nagas spew water from a natural hot spring into the first bath, which then overflows via the mouths of five more nagas into a second, larger pool. 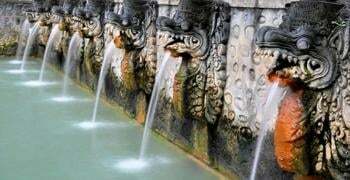 In a third pool, water pours from three-meter-high spouts to give a pummeling massage. The water is slightly sulfurous and pleasantly hot, and said to be suitable for healing skin diseases and rheumatism. Showers are available, as well as lockers and change-rooms. Beware of slippery floors when entering pools. Entrance fee of IDR 10,000 for domestic and IDR 15,000 for foreign tourists. Open daily from 8 am to 5 pm. Banjar Hot Spring is 24 km from Singaraja. Seririt is a sleepy old market town and the former commercial centre of Buleleng, located west of the villages of Banjar and Dencarik. It lies at a T-junction, with Pemuteran and Gilimanuk to the west, Lovina-Singaraja to the east and Pupuan-Tabanan to the south. The route out of Seririt through Banyuatis will bring you to Munduk in the high mountains. Munduk and environs will feature in another article. You’re probably also wanting to know about the water sports. More about that soon.